Is a Regional Action Plan on Business and Human Rights Needed? Jakarta, 1 September 2015—At the beginning of September 2015, the HRRC attended a half-day event on “Business and Human Rights Guidelines for ASEAN Community Post-2015.” Conducted by the Indonesian Representative to the AICHR in cooperation with the Netherlands Embassy, this event is the third part of a debate series aimed to provide a platform for public discussion and debate on issues relevant to ASEAN. The Ambassador of the Kingdom of the Netherlands opened the session by posing several intriguing statements on how human rights can be integrated in development. H.E. Rob Swartbol outlined the possible measures that can be taken by States and corporations according to the United Nations Guiding Principles on Business and Human Rights (UNGP). As an example of how a region and a state may incorporate the UNGP, the Ambassador cited the continuous discussions in the European Commission on UNGP implementation at the national level and the Dutch’s own 2013 National Action Plan on Business and Human Rights. Mr. Rafendi Djamin in his opening remarks emphasized that the concept of CSR is often misunderstood by CSOs as merely a window dressing exercise done by business actors. Highlighting the importance of realizing business and human rights in Indonesia, he cited as example the Jati Gede project, where the Chinese investor ignorantly said that they have no business with the livelihood of the communities to be displaced, placing the sole responsibility for the displacement and provision of remedy in the hands of the State. Important challenges regarding the application of business and human rights in Indonesia were considered, including the different levels of comprehension of stakeholders; various and sometimes overlapping rules and regulations; the ambiguous concept of CSR; and the low compliance rate of state-owned enterprises and inter-state investors among several ASEAN countries with human rights standards. The panel agreed that although the UNGP is not legally binding, it could at least provide a reference for all parties in the protection and respect of human rights and the provision of remedy to victims. The panel also discussed the viability of having prevention and enforcement mechanisms for corporations, as well as the importance of having a regional commitment or guideline on BHR. Several possibilities of improvement were offered, including defining a clearer role for NHRIs in this field and better dissemination of business and human rights principles and the aims of the ASEAN Economic Community at the national level. 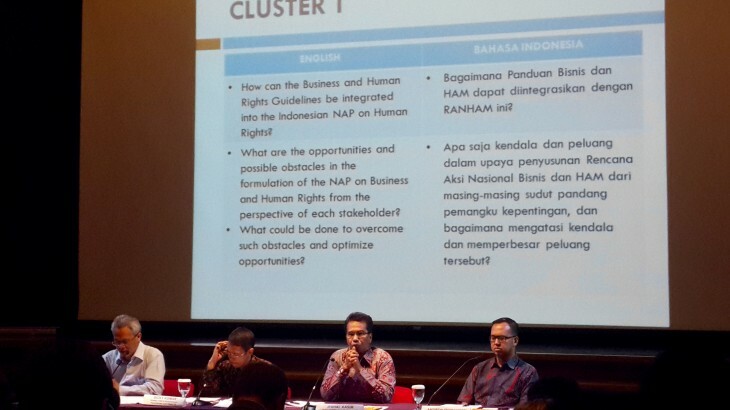 Specifically on the agenda to establish a BHR National Action Plan in Indonesia, some of the panel cautioned that this should be done only when it is synchronized with the existing Human Rights Action Plan (RANHAM) and the present laws and regulations. Mr. Saputro especially emphasized the hazard in having too many legal instruments without harmonizing them with one another. Corporations, he insisted, mostly would like to engage in good corporate governance, but overlapping and at times conflicting regulations prevent them from doing so. Mr. Kasim on the other hand also warned that BHR should not be interpreted as shifting the State’s responsibilities as the primary duty bearer of human rights. Clarification on the duty of the State and the obligations of corporations must be made, he emphasized. All the panel agreed however that the implementation of BHR’s important values should not be impeded by the absence of a National Action Plan. In his concluding remarks, Mr. Djamin said that regional guidelines are crucial and even pressing especially due to the impending free flow of capital and labor within ASEAN. The regional and national processes to develop BHR Action Plans can take place simultaneously. A regional guideline will raise awareness among the Member States on recent and emerging standards on CSR and BHR, and encourage them to take action to implement business and human rights principles by providing them with a document to refer to. Although the ASEAN Member States have different starting points, it is committed to work as a community, including in fulfilling human rights. The leadership of Indonesia in securing these rights is important. Business and Human Rights is one of the core areas of work of the HRRC and is part of the Centre’s strategic plans. Thus, the HRRC actively seeks to provide support to efforts that encourage responsible business practices and compliance with international business and human rights standards in ASEAN. All, ASEAN, Business & Human Rights, Indonesia, News. permalink.